Thanks for this, Dr. DeConick. If I have the time to watch such programs I keep a notepad near at hand and amuse myself by writing down the errors or plain misinformation in the programs. While watching the program on the Talipot tomb I came up with a page and a half. This is not to say that it isn't important to stay informed about real scholarly research. I appreciate your series of articles on the stone in question. But I don't expect the TV to provide me with scholarly research. As one in parish ministry, I am always appreciative of these sorts of little summaries. It is nice to have a place to direct people who see these sensational programs. Thanks for the good work. And I am supposed to get cable because ...? Well, As much I as I appreciate the frankness of this last post.... This is one of those posts that will be very much appreciated by confessional-apologetic scholars with a vested interest in maintaining Christianity’s "uniqueness. Moreover, since National Geographic is finally selling out and cashing in on its reputation to add an aura of legitimacy to this naked milking of a cash-cow, I think the powers that be with a vested financial interest in this will be unleashing the spin doctors again to characterize you as a “conservative” scholar. I appreciate your sentiment. But the truth is that a conservative or liberal agenda does not drive my scholarship. I am a scholar who works from a historical-critical and literary-critical perspective, and the outcome of my investigations do not matter to me except that they are built from the evidence with critical integrity. I analyze the material and what it tells me it tells me. If the Gabriel Stone told us that the Jews anticipated a messiah who would be resurrected in three days, I would tell you that. But it doesn't. It isn't even a close call. In fact, the Christian tradition had a real problem on its hand with the crucifixion and resurrection of the messiah. The Jews that the first Christians (who were Jews) were trying to convert were unconvinced by their arguments. This is why Paul says that the cross was a stumbling block to Jewish conversion. Curiously I, as an Evangelical pastor would have no problem if the stone said something about a messiah who died and rose in three days. There were all kinds of voices among what we might call Judaism in the 1st centuries BC and AD. Since as Dr. Deconick points out that the early Jewish Christians argued with other Jews about a dying and rising messiah those who might have (but didn't) talk about a dying and rising messiah weren't the people the early Jewish Christians argued against. But if the writing on the stone doesn't say that, then it doesn't. And saying on TV that this is the primary scholarly reading of what the stone says is simply false. What will interest me will be which scholars will the NG channel use to promote their viewpoint. I’m not a scholar or a minister or a missionary so help me please understand, how would this destroy the heart of Christianity? To answer your question, First a short answer and then a long one, read either or both. The short answer is that it really couldn’t destroy the heart of Christianity at all… its just being hyped that way so that it you will watch the documentary. 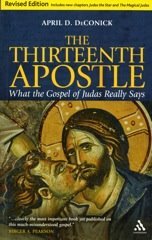 However, even IF (and it is a BIG IF) the gabriel stone is showing evidence for a Pre-Christian Jewish belief in a dead & three days resurrected messiah, that idea is ultimately neutral to the central tenet of Christianity (the resurrection of the Son of God).It won't destroy the heart of christianity. If anything, most conservative confessional scholars would welcome it and then be even more incredulous that "the Jews" did not recognize Jesus as the messiah in the first place. (I've heard these sermons my whole life. If I had no soul, I'd call zondervan with a sample chapter and cash in now). 1. The “evidence” for this reading is interpolated i.e. very dubious and the postion is a minority opinion of a scholar who is known for coming to identical conclusions in other texts and for basing his scholarly life's work on this theory. This means that he may have a vested interest in his theory's proliferation and this may have influenced him to subconsciously read ito the text here. 2. the new interpolation is very new, less than 3 year old, so its novelety is part of the reason its getting some attention. However, that also means that the jury is still out as far as peer-reviwed scholarly consensus goes. 3. This dubious reading/-interpolation is being interpreted in a way seems to show that a uniquely Christian claim is no longer Christian (but really Jewish instead). There’s nothing wrong if this is/was/were the reality and had evidence. However, this is one of those areas where its very easy to transgress the laws of historical -critical scholarship unknowingly do to personal beliefs. Some people could, if it suited their agenda, interpret this minority scholarly position to be a “Win” for Judaism and a “loss” for Christianity in that it takes one of Christianity’s “unique distinctive” and turns it into a Jewish one. 4. The commercial hyenas have a vested economic agenda that involves doing exactly that and hyping it to no end for and then legitimizing it with National geographic's academically irresponsible backing of the “documentary” aimed at the masses which pushes the minority of scholarship and then interprets it to attack one of Christianity’s “distinctive” (the resurrected messiah). They are doing this, dishonestly, purely to make a buck, with reckless disregard for how this will only further strengthen your average Christian’s mistrust/disregard for religious scholarship. What I worry about is not some impact the Gabriel Stone may have on Christianity, but rather the impact which the complete lack of response to what three of our top longest standing NT scholars have said - indisputably, "something that is actually important to say that may indeed impact Christianity - (even) its central tenet the resurrection", may have. Again I make reference to a reconstruction of the Jesus tradition contained in the Comments dated April12,2009 and April 13, 2009, to your blog: My Decision About the Jesus Project, Feb. 5, 2009. Plus a relevant Comment dated April 17, 2009. Orville, is that you? My gosh it has been a long time. What are you up to? I appreciate Orville's clarfication. I certainly did not mean to imply that being in parish ministry meant that I was looking to direct parishioners to a scholar that would support my own confessional view. I appreciate the bibliobloggers who provide informed historical-critical reflection on the source data. In addition to my seminary training, my own academic training is in secular religious studies departments and in historiography. I know that all historical research is inevitably mediated through the interpretive lens of the scholar, but I certainly did not mean to suggest that Dr. deConick was offering an interpretation that would be used to buttress narrow-minded confessional views (conservative or liberal). I too share your confessional views and I certainly also share your feelings on this matter. My initial comment did not have you in mind (but I see how it looked just like that). I live in Tulsa, Ok. The buckle of the bible belt and went to a very confessional conservative seminary here. I was commenting with them in mind, but I totally see how it looked like I was commenting about you too and lumping you in, thanks for the clarification. No worries. I appreciate your thoughtfulness (and your comments). I emailed you at your Rice email address so as not to detract from the discussion here on the blog. April - I posted my little defense of your suggestion over my own blog, PaleoBabble. Knohl is too hasty in his dismissal of it. Dr. Deconick, I'm new to your blog. Would you say this does anything to undermine N.T. Wright's argument in The Resurrection of the Son of God? Where does Gabriel's command and the prince of princes fit into all of this then?